So I wrote about managing files with TinyMCE, but didn’t quite actually post any code (only did a functional analysis and provided a workflow). In this follow up I’ll be handling on how to add a file delete option to TinyFCK, along with the code needed for it, in a nice step by step tutorial/howto/whatever you’d like to call it. The code for the WordPress alike system is planned somewhere in the future. Implement TinyFCK and make sure that it works. [js]oCell.innerHTML = sLink + ‘ ‘ + dLink + ‘ ‘ ; // Modded by Bramus! $sErrorNumber = ‘102’ ; // Invalid file name. // Create the “Error” node. [php]case ‘DeleteFile’ : // Added by Bramus! i thought long about leaving just a senseless comment here because this sounds all very barcelona to me, but i guess your serious about it. so what shall i do now? …. Interesting code indeed. Sort of weird that “FCKEditor” would not implement this in their connectors. I worked on it for a couple of hours, and was unable to get the connector to plug correctly. It only would refresh the contents of the directory when creating a sub directory. One small addition: Modify line 74 to set the width of the icon cell to cater for the new image. I used 35 to cater for an additional 16 pixel wide image. Thanx very much for this code. I was searching nearly 3 hours for a delete function for fckeditor and finaly found your page. It war realy easy with your help to hack in the delete function. Thanx again! Pingback: 1983 » Wordpress, IIS and a crapload of hacking. Well done. I’ve been looking for a simple image upload function that works with tinyMCE so I can quickly roll simple WYSIWYG forms in my apps. Thank you very very much. I searching like this from many days. You are Rock. hi, is there anyway to implement this for folder + folder with reclusive level too? Hi Isaac, although the code for it isn’t there, it surely would be possible to implement this with a likewise code. Instead of PHP’s unlink function, the rmdir function would be needed to get called. Be sure to read the rmdir function comments too, as a directory should be empty (tip: there are plenty of recursive dir deletion functions available, just google “php delete directory recursively” or something like that). Thank you very much! You saved me plenty of time trying to do it on my own. Thanks for the ‘delete option’ using it on my last few projects. it has to be add after tag after “fileName +” if not you will not see the file name. Just this, but you did a great work, thanks again. Bramus! You rock! Your solution is phenominal and simple. I just created the same solution for FCKEditor .NET!!! It was easy after reading your information listed above. Again – THANK YOU BRAMUS! 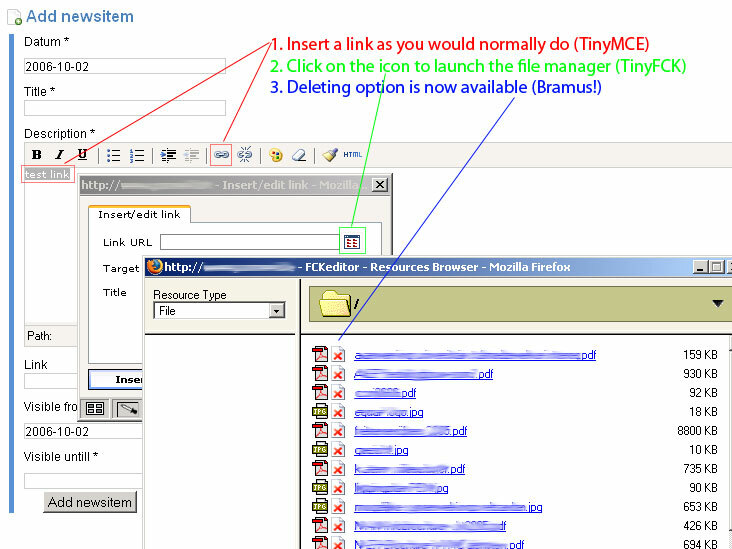 nice one bramus, worked like a charm! Hi, is there anyone who has a coldfusion function for this? Thanks all. DFi: Invalid XML response from connector..
And I can’t find out what the problem is! Thanks a lot for this hack. Exactly what I need to fix the FCKeditor plugin for WordPress. Though, I am using version 2.3.1 and it seems the code-structure has changed. I can not recognize where I need to replace something. The code looks different now. Could you perhaps explain again where the code needs to be replaced in 2.3.1? Thank you! I loved your hack code. Its wonderfull and very nice. Thank’s, so much. i tried to get it working only to find out it works only in the BrowseServer window which I have mine disabled. Can I ask for advice on how to adapt your code so that – a file is deleted whenever the user presses the “Delete” button on the keyboard. I know it will delete the tag but how do I make it delete the image as well? can yu plz write a function to delete folders as well ? This looks great. Just having some teething problems getting it to work with FCKeditor 2.6.4. I was getting the “DFi: Invalid XML response from connector..” error, so followed Oleg’s instructions above. Now when I open the image browser I get an alert saying “The “GetFoldersAndFiles” command isn’t allowed” and none of the files are displayed. Any idea how to get round this? Ah – I’m an idiot. I was adding “$Config[‘ConfigAllowedCommands’] = array(…, ‘DeleteFile’) ;” to the end of config.php. In fact, you’re just meant to add “, ‘DeleteFile’” to that line which already exists! Simply brilliant! I had been looking for a solution like this for quite a while and luckily stumbled on your site. Thanks for sharing…it is greatly appreciated! I added your mods to a different version of FCKEditor, but it was still easy to modify to my needs based on your instructions. Thanks again! Thank you so much for this code. Well-explained and it works! Oleg’s hint to add ‘DeleteFile’ to the ‘ConfigAllowedCommands’ array was crucial, too. Thanks again! Still works in FCKeditor 2.6.5. Code has changed somewhat, but anybody with a little knowledge in PHP/HTML/JS can easily follow your steps in a couple of minutes. Has anybody got this working on FCKEditor 2.6.2 ? Notice that the only change is lowercased “error”. I’ve examined connector’s XML source and it appears, that tag is lowercased. This solved my problem.